New technology, there are those who embrace it or those who reject it or seeing it as cheating in some way. It’s not a new phenomena or even restricted to railway modelling, I remember such discussions when digital illustration started to appear. With a hobby of course it’s up to you how you pursue it. Do you want the end result to be the best it can be or do you enjoy the route to the end result more? No one is ‘right’ in such circumstances but if someone choses to embrace new technology is it fair to accuse them of cheating in some way? The finescale end of the hobby has always had a reputation for valuing the journey over the destination and for a long time detailed or converted RTR was frowned on as not proper modelling by those who scratchbuild stuff when in many cases the RTR looked much more like it was supposed to than the scratchbuilt stuff anyway. In reality though the finescalers have usually been the ones to embrace new technology and ideas first and the current crop of high quality RTR is largely down to people wanting something better. You hear it all the time, we’ve never had it so good and it’s probably true but things don’t get better if people just accept what they are given – they have to ‘want’ better too. It’s probably worth at this point mentioning that we never had it so good 20 years ago and we will probably still be saying it 20 years from now. Does anyone really believe that the current crop of RTR is the best we are ever to see? So to the point – Laser cut buildings. Already people are saying that its cheating, that you just push a button and a building pops out of a machine but in reality it’s just a very very clever scalpel and while I believe the end result is better is it any easier or quicker? What you see above is a simple canal bridge drawing for Brettell Road. 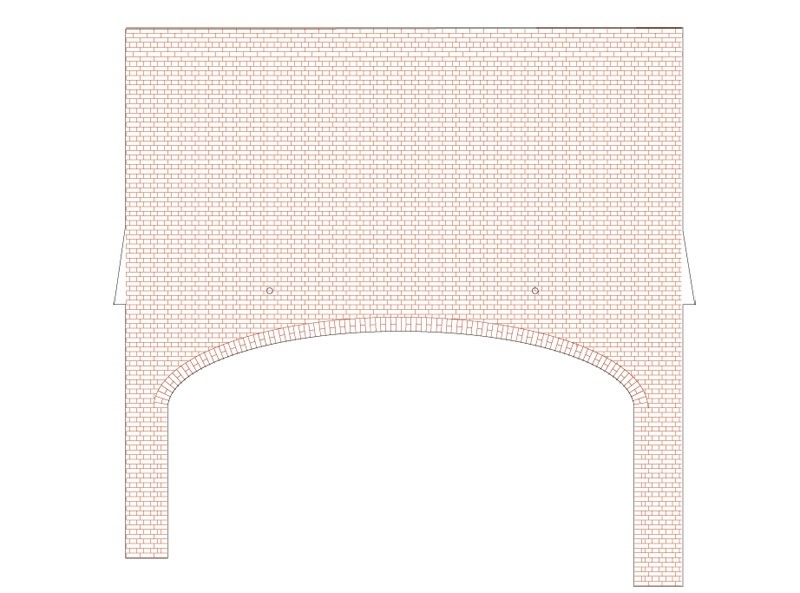 Its drawn in illustrator and while I have used some time-saving tricks like custom brushes for the arch and a custom fill for the brick pattern it seemed to take a lot longer than just getting a sheet of brick plasticard and cutting it out. The thing is though I could convert the pattern to lines (expand appearance for those interested) and then tweak it. For example I could easily recreate the half width header near the corners in an English Bond wall while doing so with plasticard would have been a massive faff. In fact I wonder if anyone has even bothered, I know I didn’t think it worth the effort! Above is the actual wall loosely positioned on its canal bed and towpath. The top row are routed and cut by Tim. However laser cut can be a bit clinical. For the towpath I wanted a cobbled section but also a dirt section to – the finished cut was attacked with files and sandpaper to roughen it up. Going back to the point of New technology and illustration, I always thought, if Michelangelo or Leonardo Da Vinci had Photoshop would they have used it? Id bet that they would! The wall looks superb. For much of the grunt work, which is repetitive and brain-numbing, I prefer to hand over to new technology…so that the modeller can do what he or she does best, which is breathing life and atmosphere into the model by felicitous painting and finishing as you have done here. For me, “new technology” frees me up and spares countless hours of drudgery. But if folk want to scribe each brick or whatever by hand, it’s their hobby too, and they must do what gives them pleasure. Some interesting thoughts Jim. One way of reading your third sentence is that if you want the best results, you may have to use the new technology. I am sure you did not mean it that way and of course outstanding results can achieve by new technology and by traditional methods. Often though traditional methods need a higher level of skiil to achieve the results and whilst anyone can with practice develop such skills, it does take time. You wonder if anyone has bothered to get the correct bonding on a model of a wall or other brick built structure. Well yes they have and do so. The buildings on The vale scene at Pendon are I think still made by hand scribing card which isn then painted with water colours. 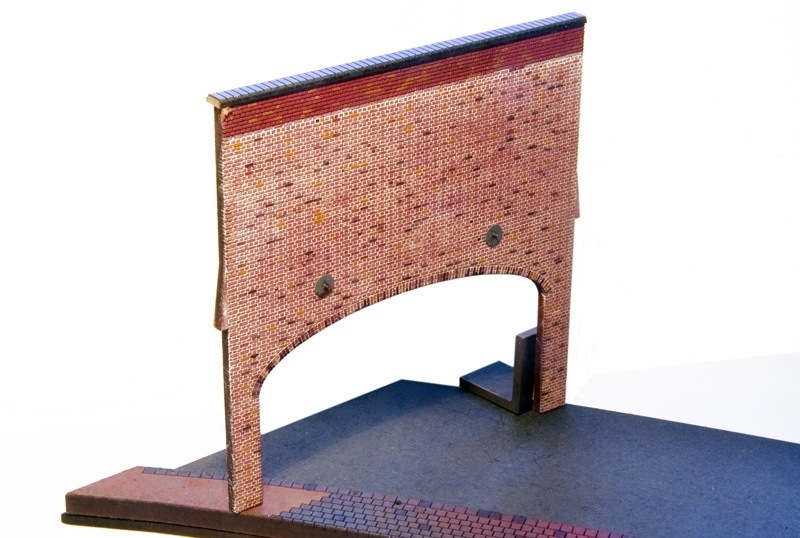 I still have a model of the tunnel mouth at Kemp Town in Brighton made by the same method. The person who did this first did a pencil drewing shouwing all the bonding, then he did a tracing in ink for use on the work bench. The bricks were drawn out on the card in pencil and each one was then scribed to represnt the morter. So each brick has been drawen four times! Even the lining of the tunnel has been hand scribed and a comparison with pictures shows that the bonding on the model exactly represents what is on the real thing. Mad? Possibly. Effective? Very. Would I do the same? Quite possibly if I wanted to, but now that we have new technology I would use that to scribe the bricks but the bonding would have to be exact. You are of course correct that hand scribed (or paper chad) brickwork is no extra effort to get right. However I was wondering if those of us who use plasticard brickwork (or even printed) fill and scribe the bricks at the corner of walls. First post to your site Jim, but been following your RMWeb then this site for years and hats off to your superb combination of observational skill and technical acuity! I work in architecture and this is an area where my profession and my modelling interest keenly overlap!! I’m interested to know, are you back filling your scribed joints (bed and perp joints) with “mortar”? Much 19thC brickwork especially on engineering brickwork on the real railway was flush pointed, and the difference between the surface of the brick and the pointing is as much to do with texture, deflection of light and colour as accurate brick bond, joints, junctions and dimensions. Most modellers don’t know the difference between metric and imperial brick dimensions too, the metric being smaller and standardised and the imperial being larger and the further back you go, the less standardised. Technical question on your canal bridge? Is it based on a prototype? I would have expected the arch to have more courses to be physically capable of supporting the load above it? I’m not saying you’re wrong, but I know you love to model accurately, so am curious. Ive used artists acrylic for the mortar and it does act like a filler. Having said that some old walls seem to almost have no mortar in them now! The bridge is based on a prototype but I freely admit I did extend the height a bit. Didn’t think about the effects this would have on the arch itself though! Hi Jim, I’ve only just started to use Illustrator for creating brickwork for lasercutting. I’ve tried various time saving techniques for the archwork and bricks, but still haven’t yet found a fast method. The custom brushes and patterns is a great idea, I’ll have to look into that! In my case I just don’t have the skills to make this stuff by hand, but I want the best results so laser cutting is the answer. Good luck with it, I’ve just seen the boards on Modellers United as well which look great. To be honest I’m all for laser-cutting for engineering terms, but for cladding and detailing I still find plastic to be the most realistic. I was looking at Ancorton Models who are releasing a whole heap of laser-cut buildings, many of which reek of ‘toy town’ to me. I think the main things I dislike about laser-cut structures are the uniformity of levels, as even largely flat surfaces such as concrete pavers or roof tiles have a degree of variation in height My other concern is the question of texture, something which is a problem with card buildings alike. Scalescenes brick papers are probably the best I’ve seen for card, though the problem of one big sheen arises again. Whilst I can appreciate that laser-cutting saves loads of time and breaks up the brickwork pattern, the fact of texture that can be achieved with plastics is missing. I suspect the placement of each object is important, as I’d be more lenient with card or laser cut structures towards the back of a layout as low relief. I do agree. Care needs to be taken in the drawing stage to make things not too perfect. In some respects a slightly scruffy build using traditional methods sometimes creates a more believable result. Watching as usual, with interest. Chad, regarding ‘one big sheen’ I have found the use of a reliable resistant printer ink (in my case Epson Durabrite) and a good quality 90gm minimum paper (I have never been a fan of photopaper for S’ scenes) allows subtle washes of artist quality watercolour to be applied without damaging the printed surface to vary the tone of the ‘brick prairie’. Additionally, only such papers can allow one to moisten an area, say, the lower margins of a wall and drop on a staining colour to flow outward/upwards to accurately give ‘feet in the water’ effects. I’ll stick with paper and card technology, but confess to having considerale interest in the programmable cutters to produce railings and the like.